The information you're presenting needs to be equally clear for people in both the front and back rows. 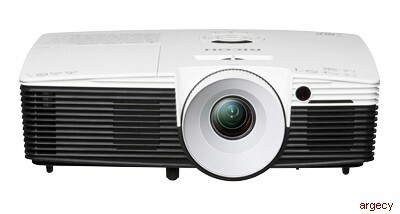 Switch on Ricoh's PJ HD5450 projector, and you'll see how industry-leading brightness puts everyone in the picture- ven when it's an image up to 300 diagonal inches. Last-minute projector problems can throw you off your game. Check out the PJ HD5450 anytime by connecting it to your network. You can see if there are any issues and confirm the time remaining on the lamp. If the lamp wasn't turned off after a meeting, you can switch it off remotely. No need to worry about colored walls or even blackboards when you use the PJ HD5450. You can correct for wall color, and keystone correction to fixes mage distortion. Sometimes a lifelike representation is the best way to get across your message. Bring on your 3D engineering/design model, product packaging or Tyrannosaurus Rex. The projector's ready; just purchase the optional 3D glasses. You can put off adding lamps to your budget for a long time when you have 3,000 hours to work with - or 4,000 hours in eco-mode when the projector adjusts lamp brightness automatically to conserve energy. Native support for Frame Sequential 3D format. Other sources may require a converter that is not provided from Ricoh. 2In default condition, VGA Out is disabled in Standby mode. VGA out is enabled when projector is turned on. The Ricoh PJ HD5450 is under warranty against defects for a period of three years from the date of purchase. Consumables are under warranty for a period of 90 days from the date of purchase or until depleted, whichever comes first. Please refer to warranty documents shipped with the product for more details.